This is where you can purchase CDs, a DVD or the booklet "Advanced Accordion Methods". I ship Domestic and International. Payment is by PayPal (sorry no credit cards at this time) but I will take personal checks for domestic U.S. orders (contact me at email: famousaccordion@sbcglobal.net if you need to pay by check). For International orders payment is via PayPal only and in U.S. dollars. SORRY, NO INTERNATIONAL PERSONAL CHECKS! I WILL ACCEPT DOMESTIC PERSONAL CHECKS AND I WILL SHIP CD'S ONCE CHECK CLEARS. 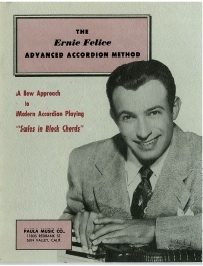 ERNIE FELICE SINGLE CD: $11.00. A nice sample of songs listed below in the left column. Price includes postage within the U.S. Pay with PayPal. ERNIE FELICE 3-CD (BEST DEAL!). This 3 CD set includes all songs from the single CD plus many more. See song list below. Price includes postage within the U.S. $20.00. Pay with PayPal. 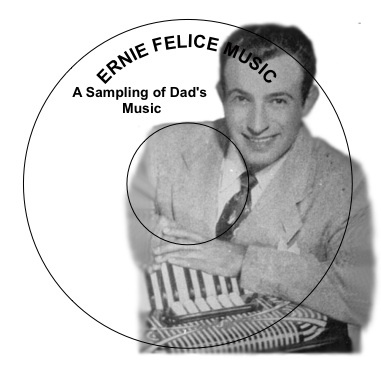 INTERNATIONAL ORDERS FOR ERNIE FELICE SINGLE CD SAMPLER: $16.00. This single CD only includes songs listed below in the left column. International postage included. International orders use PayPal only. 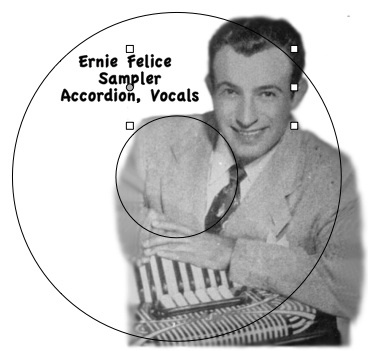 INTERNATIONAL ORDERS FOR ERNIE FELICE 3-CD SAMPLER: $28.00 . This 3 CD Sampler includes all songs from the single CD plus many more. See song list below.. Price includes International postage. International orders pay with PayPal only. BELOW IN THE LEFT COLUMN ARE THE SONGS INCLUDED IN THE SINGLE CD SAMPLER. IF YOU ORDER THE 3-CD SAMPLER, ALL SONGS FROM COLUMNS 1, 2 & 3 ARE INCLUDED. 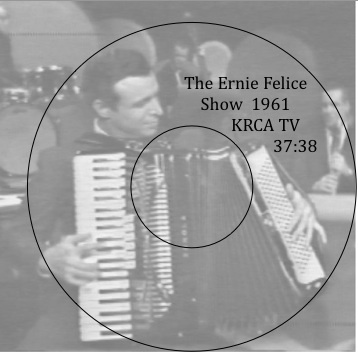 ALL SONGS ARE OF THE ERNIE FELICE QUARTET FEATURING HIS ACCORDION PLAYING AND MOST INCLUDE HIS VOCALS EXCEPT FOR THOSE SONGS THAT FEATURED BENNY GOODMAN, DORIS DAY, MARTHA TILTON, DINAH SHORE OR THE PIED PIPERS. ALL RECORDINGS WERE SOURCED FROM THE AIR-CHECK MASTERS OWNED BY ERNIE FELICE. NOTE: I GUARANTEE THE CD AND DVD AND I WILL GLADLY REPLACE ANY DISC THAT DOES NOT PLAY. THE DVD IS IN THE NTSC, NOT PAL. THESE RECORDED DISCS MAY NOT BE COMPATIBLE ON SOME OLDER COMPUTERS, CD OR DVD PLAYERS. I DO NOT GUARANTEE AGAINST OUTDATED HARDWARE, ONLY DEFECTIVE DISCS. THANK YOU!!! PURCHASE PDF FILE OF "ADVANCED ACCORDION METHODS"
Advanced Accordion Method book (PDF file will be emailed). Lessons include Ernie's techniques on scales, right-hand technique, bellows exercise, a variety of block chord exercises & rhythmic block scales.